Looking for an off the beaten path superhero comic? The Unbeatable Squirrel Girl, Volume One just might be the ticket. Squirrel Girl is in the Marvel Universe of comics and was actually first introduced back in 1991. Back then she was fourteen, in high school and crushing on Tony Stark (aka Iron Man), kind of scrawny and looked so 1990s. Thank goodness she has gotten an update! Current Squirrel Girl even comments on her past poor fashion choices. tail is much fluffier and squirrelier, she has a much better outfit and she no longer has black diamonds around her eyes that make her look like an evil clown. She wears a squirrel ears headband, acorn earrings, has a bit of a buck-toothed smile and her squirrel friend Tippy-Toe wears a pink bow around her neck. 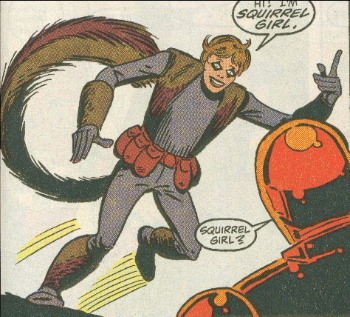 When Squirrel Girl is incognito as Doreen, she tucks her tail into her pants which gives her a rather round and pronounced booty, much to her delight. Technically, Squirrel Girl falls into the mutant class of superheroes but doesn’t want to have anything to do with the X-Men. She is half squirrel, half girl which means she has the proportional speed and strength or a squirrel. She also speaks squirrel and she and Tippy-Toe are frequently helped by their squirrel friends when fighting evil. Doreen is majoring in computer science at college and her first day there doesn’t quite go as planned. her roommate is ok but when they go to orientation Doreen doesn’t get a chance to sign up for a single club because she has to rush out in order to save the earth from being destroyed by Galacticus, Devourer of Worlds. Squirrel Girl is confident, smart, sassy, and fun. Being part squirrel she kind of acts like one, zipping here and there, never staying still for more than a minute or two and constantly chattering about something. She is strong but she is not the kind of superhero who solves things by throwing punches. She is tricksy and in fact manages to defeat Galacticus by turning him into a friend. The Unbeatable Squirrel Girl is not a thinker. There are no lessons to be learned. It is nothing but pure frenetic squirrel entertainment. I enjoyed the comic so much that my antipathy for real-life squirrels may have slipped a little. I’m not about to run out to the garden and try to make friends with them, only, perhaps, I can appreciate their daredevil antics a little more than I did before. Hmmm…. never heard of a squirrel superhero before! I would like to see a series on Justice Gerbils of America! cirtnecce, I know! I wish I could speak squirrel, it would be a totally useful language to have! She is, I hope, a red squirrel as opposed to a grey? The grey squirrels in my garden and I run a constant battle which at the moment they are winning one bite to nil. Alex, heh, her species of squirrel is rather ambiguous so as to appeal to a wider audience 😉 My sympathies for your grey squirrel battles. I am very good at losing them in my garden too! Jenny, I did! Not at first though. I noticed there was tiny pale writing at the bottom but gosh it was hard to see so I didn’t bother until about a third of the way through. Then of course like you I had to go back and read the earlier ones. I’m glad I have good reading glasses because there was no way I’d be able to read them otherwise! I love the word “squirrelier”. Reminds me of the first time we lived in the US, in Northern Va, and we had some lovely friends. The fellow would say something was “squirrelly” but the pronunciation sounded to us like “squirly”. And the context didn’t help much. I’m not sure I’m up to “pure frenetic squirrel entertainment” but I love your enthusiastic write-up and the comic’s encouragement of you to rethink your squirrel antipathy. I’m thinking we might need an Unbeatable Possum Girl book here. Similar tail to squash into pants too! Our possums are different to yours of course but they are problematical in gardens here. They can also get into roofs and make all sorts of rackets. We once saw one running along the back fence when we were living in California. Didn’t know what it was at first. Didn’t know you had possums, and anyhow it didn’t look like any possum we knew. Looked more like a giant rat – I think because it’s face is longer and pointier than ours. So I had to look up what your possums look like and they are kind of cute! Sort of a cross between a squirrel and what I recognize as a possum. The ones we have here can cause all kinds of mayhem too, plus they can be aggressive if they have babies with them. They tend to be shy, but the one that visited me didn’t seem afraid of people at all! That’s a good description, Stefanie, for someone who doesn’t know them.